The colors are accurate and it has held up to washing. The Nicole coverlet set will bring an elegant look to your bedroom. Varying blue and gray prints run along the bottom, and a dark blue border outlines the coverlet creating dimension and depth. Made from polyester and a cotton filling, this coverlet is machine washable for easy care. Two white and blue decorative pillows with embroidered details complete the look. My set came on time exactly as promised. Even though it is a beautiful set I was and still am a little disappointed because the solid blue side in the picture is such a rich vibrant blue but the one I got is more of a dull medium shade of blue. I've matched that blue with fabric to make additional pillows for my bed, just not the vibrant blue I was anticipating. Do you offer an option to purchase more shams and the two decorative pillows? I researched this piece for a while. It is also available at Kohl's for a good bit more. I bought it when Overstock was running a sale. My daughter LOVES it and we are using it for a "Frozen" inspired room without getting too "commercial." Excited for it to all come together. Great price for what I got! This Intelligent Design Nicole 5-Piece Coverlet Set is one of my favorite bedding that I have ever bought. It is so beautiful. It is so rich in blue that it stands out along with the gray, black and white. The colors are true to the pictures on the website. The coverlet is made of 100% polyester which is durable for someone who has a cat. We love the rich blues on this very attractive 5-piece Coverlet Set. The coverlet is made of buttery soft fabric and is light weight for when you don't need a heavy layer. I have not washed it yet but it looks like it will hold up well. I'm very pleased with this purchase. This set is even more beautiful in person. The material is very durable and not too heavy. The two added decorative pillows make your bed look more sophisticated. In very happy I bought this product. This is my favorite ever bedding!! The quilt is a great weight, not to heavy, not too thin. In winter I just add a blue fleece blanket. The colors are just as pictured,the blues are nice and bright complimented by the grays. The pillows and shams are very pretty. Its it well made! Beautiful! So pretty! I bought this set to brighten up my guest room! Just as pictured and the extra decorative pillows complete the look! Very soft and comfortable. I would purchase this again! I love how the set looks put together. It looks great in my master bedroom! The quilt is lightweight and the colors really pop with my dark walls. I suggest getting this set! We use this in our guest room and really like it. The little accent pillows add a nice, inviting look. I was looking for a specific blue to match my walls so was glad to have found this one. I purchase this Colvert set for my mother's new apartment. Her bedroom walls are beige in color so this set brings a beautiful burst of blue into that space. I would recommend to a friend. This set was beyond my expectations. Nicely made, colors beautiful. Extra pillows are an added bonus. Cute and have received many compliments. Exactly like the picture. Have had this set for a few years and it’s held up incredibly well. Would buy again. Very elegant and great price. "what is a coverlet...a duvet? that I can insert a comforter? or is this a quilt?" Hello mac0224, This set is so beautiful! 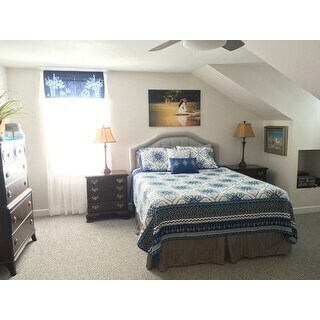 The coverlet is a smaller version of a bedspread, with the sides of the coverlet extending halfway to the floor. Rather than covering the pillows, a coverlet usually has matching decorative shams. I hope this information helps. Thanks for shopping with us.